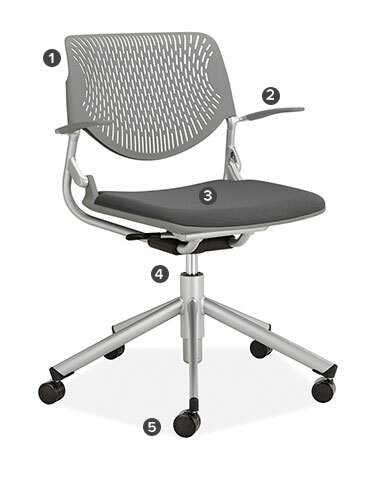 Runa's silhouette makes it a comfortable and versatile office chair solution. Its lightweight and compact design makes it easy to move from room to room, ideal for conference rooms, collaborative workspaces and more. Runa's flexible back cradles you as you sit while reducing pressure points. A multi-density foam seat cushion offers a comfortable seat and is softer in front for thigh comfort and firmer in back for additional support. This chair’s flexible back cradles you as you sit while reducing pressure points. Armrests offer extra support throughout the workday to reduce strain on your upper arms and neck. This chair has fixed armrests to offer the right amount of support.